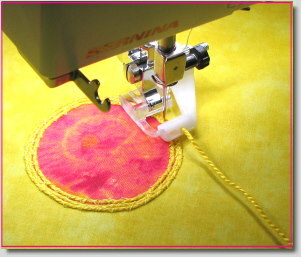 Free motion embroidery is a very relaxing activity. 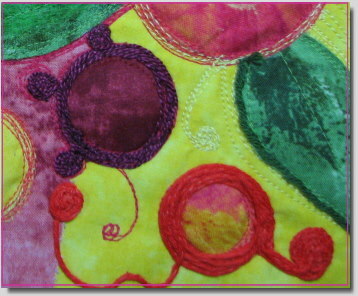 With just a few stitches in your repertoire, you can thread paint beautiful embellishments onto a variety of projects. In Garden Gazing, I used several stitches that I would like to share with you. 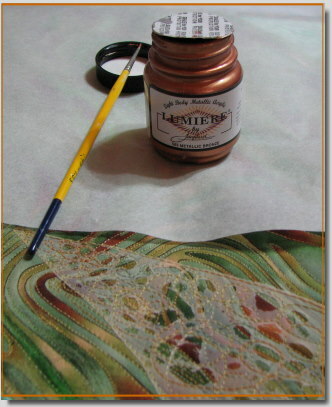 Remember to stabilize your fabric well before thread painting. All those stitches need something to wrap themselves around. 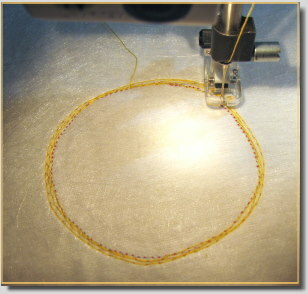 Probably the most versatile of stitches is the free motion zig zag stitch. 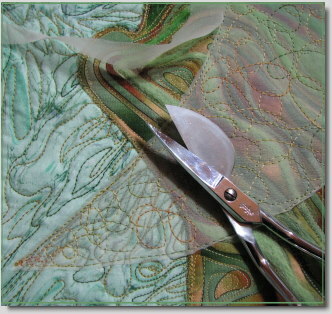 By changing the position of your fabric, the width of the stitch, or your tensions, you can alter the look to suite your purposes. 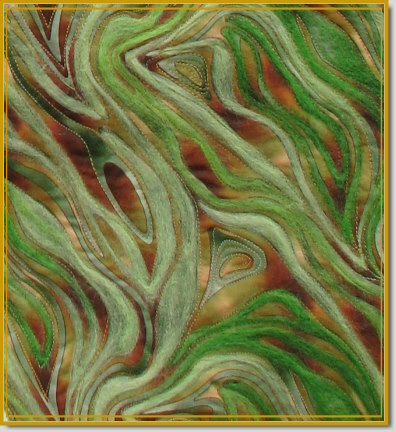 I often slant my fabric ever so slightly so that my grasses take on a wavy effect. 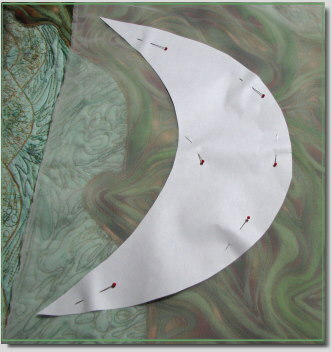 Other times I alter the width of the stitch or use a lighter or darker thread in the same color family. 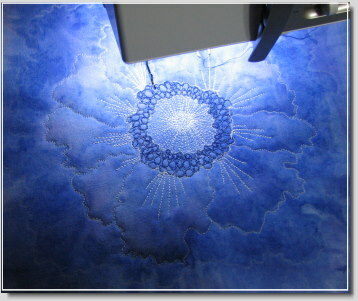 In the following photos, you can see the progression of thread painting grass. 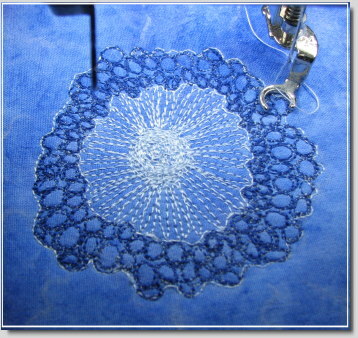 In the first two photos, I used a stitch width of 0.7. When I switched to a darker color in the third photo, I also changed the stitch width to 0.9. 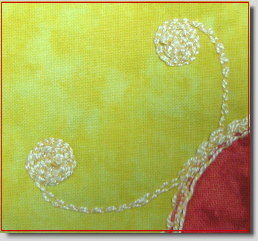 A wide stitch width can be used for filling in background areas where you don’t need definition. 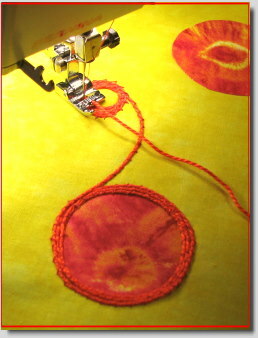 By moving your fabric quickly, you can cover a large area in a short amount of time. 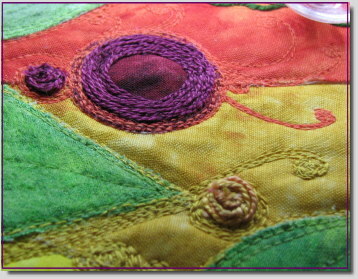 You can also layer this stitch, using a variety of colors for an interesting effect. 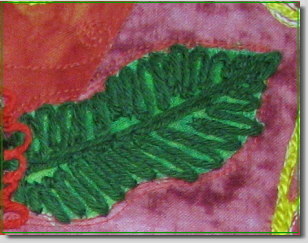 To thread paint ferns or variegate your flora, the whip stitch comes in handy. 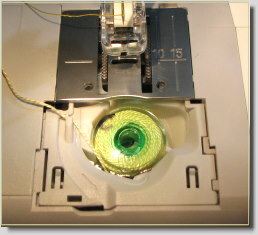 To accomplish this stitch a little machine adjustment is needed. First, tighten your top tension. 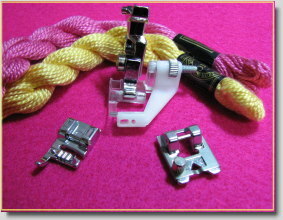 On a Bernina, I set the top tension at 7. 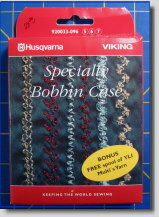 Next, loosen your bobbin tension slightly and fill your bobbin with a decorative thread, such as rayon. 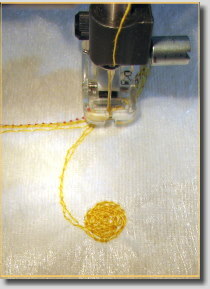 Use a cotton embroidery thread (or something similar) in the needle. Make sure you use two different color values when choosing threads. 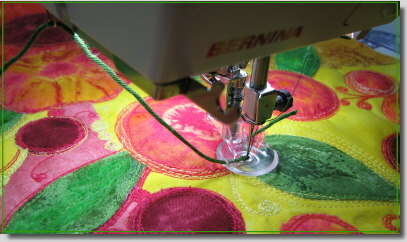 Set your machine on a zig zag stitch, drop the feed dogs, and free motion stitch a pretty little plant or fern. 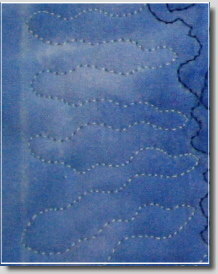 To thread paint small leaves, simply us a narrow free motion zig zag stitch and move slowly as you create your shapes. 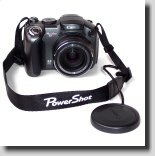 You can use even tension adjustments or play with the tensions for interesting effects. Flowers are formed in a similar fashion. 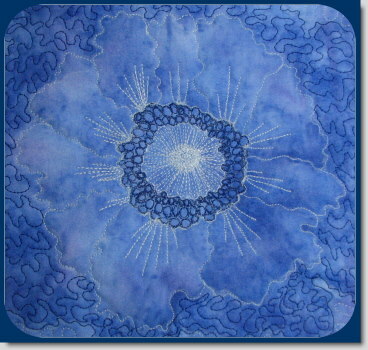 For the tall hyacinth, I used a stitch width of 1.3 and created “V” shapes, covering my stitch path twice. 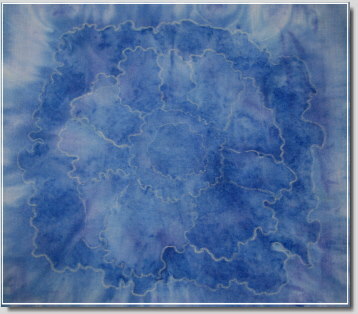 For hanging flowers, I used the same stitch but changed the shape of the flower. 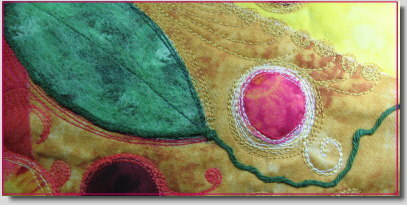 Individual petals are very easy to stitch. 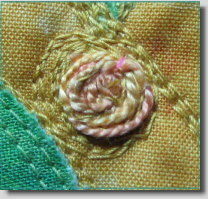 I used a 1.1 stitch width in this example, forming the outline first and then filling in the petal. 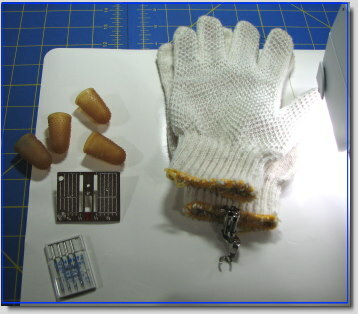 You can also build these stitches up for more texture. 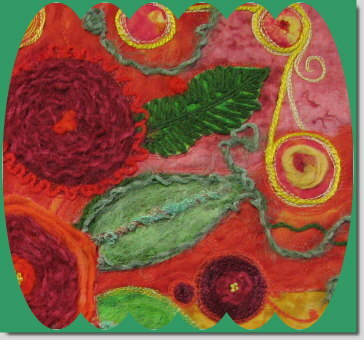 Although I didn’t use them in this project, built up free motion straight stitches can be used to thread paint fields of grass, leaf veins, tree trunks, flowers, fruit, and a host of other wonderful things. They’re also very useful in shading. 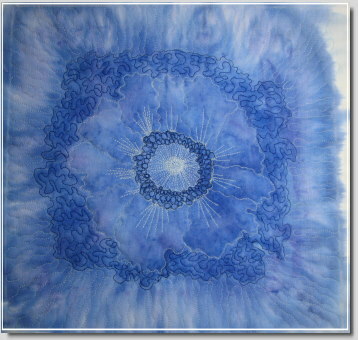 If you’ve never tried your hand at free motion embroidery, I hope you will experiment with a few of these techniques and begin embellishing your projects with a little thread painting.